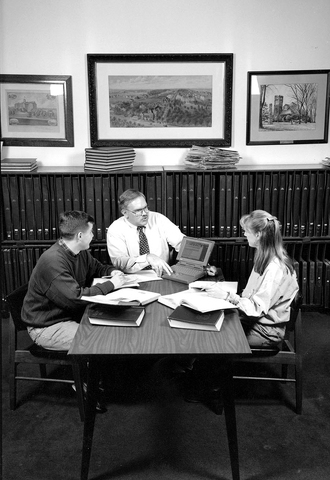 (Penn State University Archives) The columnist with Penn State students in the archives, circa 1992. In September 1990, Witt Yeagley, editor, and Mimi Barash Coppersmith, publisher, invited me to write a monthly column for Town & Gown magazine, and I happily accepted. With this August 2018 piece, my skein reaches 300, and I’m turning over my space to new writers and new ideas. Writing “Penn State Diary” has been a fascinating and rewarding experience for me. I’ve never had to write for a living, but as a Penn State faculty member, I have always written academic publications, lengthy reports, and every kind of letter, memo, and email imaginable. Since my retirement in 2007, I’ve now also written three books with Penn State connections. These columns, however, have been a highlight of my professional life as an archivist and historian. They’ve enabled me to shed some light on university and community history as well as reveal some of the secrets of what archivists do. I began “Penn State Diary” with the idea that I wanted to bring you stories from the Penn State Archives in a way that detailed not only history, but also how that history was revealed through the archives’ historical records. On occasion, I went beyond that to explain how archivists helped that research to be done. I keep a database of my articles to help me review topics I’ve written about before, and it shows I’ve written almost 40 columns on archival work. They range from dispelling stereotypes to explaining how collections are acquired, organized, preserved, and presented to the public. I’ve talked a lot about the challenges of technology, from using computers to manage archives to the evolution of archival records from paper to digital. There have been some memorable articles such as contributing to the African-American Chronicles website for black history at Penn State, and the planning and creation of the All-Sports Museum at Beaver Stadium. But I’ve also tackled topics like shredding documents in the Enron-Arthur Anderson case, which illustrated that while we can’t save everything, we need to manage records destruction in an appropriate and legal way. Of course, it’s the historical topics that people seem to like the most. Many of the ideas for these columns came from questions I was asked every day in the archives. Some of these were “myth-busters” – Old Main didn’t burn down, the students didn’t build the first buildings, and that word “Nittany” didn’t come from a fanciful Indian princess. In others, I described the history of buildings and places on campus, or programs like campus film and television production or art education courses. I’ve done biographical sketches of people ranging from trustees Charles Schwab and Andrew Carnegie, to presidents Evan Pugh and Edwin Sparks, to memorable faculty members like Lawrence Lattman, whose GSci 20 classes enthralled thousands of students in the 1960s (including me). People inevitably ask me about my favorite columns, so here, in no particular order, are some of those. I’ve always been drawn to early Penn State, so pieces on the first trustees and the “founding fathers,” the origins and meaning of the “Farmers’ High School” name, and school rules for students, are among my picks. Another interesting set of topics for me revolved around the master planning of campus and the architectural styles of our buildings. There was also dorm-building and the rise of downtown apartments for student housing, and “Happy Valley’s” isolation along with the highways, bus and train transportation that enabled us to get here. Perhaps the most unexpected was the story of how Penn State rejected the offer of Philadelphia’s Medico-Chirurgical Institute in the 19th century, which would have given us both a medical school and a presence in Philadelphia from an early date. Another was the story of President John Martin Thomas, the forgotten visionary who launched Penn State’s first major fundraising campaign – in the 1920s – and, if successful, would have transformed us into the Pennsylvania State University we became 30 years later. As I’ve approached and passed the retirement milestone, I’ve added some reflections and autobiographical content. Certainly, the misadventures of my summer 1966 trip to Atlantic City in the back of an open convertible held more than a whiff of nostalgia. I’ve also tried to pay tribute to mentors, both historical and personal, who’ve inspired or helped me along the way. Earlier Penn State archivists and historians, like Erwin Runkle, Abbie Cromer, Wayland Dunaway, and Peg Riley, laid the foundation for the University Archives. Colleagues like Charley Mann, Ron Filippelli, and Jackie Melander helped me realize professional goals and connect me to broader communities. None of these stories would’ve been told if it hadn’t been for Mimi and the succession of T&G editors over these 28 years of writing. For them and the many others who helped along the way, my gratitude overflows. And thank you readers for your interest and patience. While I’m signing off for now, I’m not giving up writing, so look for future efforts from me.